The elbow functions to move the arm like a hinge (forward and backward) and in rotation (twisting outward and inward). The biceps muscle is the major muscle that flexes the elbow hinge. The triceps muscle is the major muscle that extends the elbow hinge. 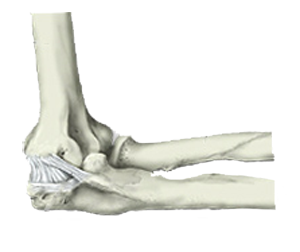 The outer bone of the elbow is referred to as the lateral epicondyle and is a part of the humerus bone. Tendons are attached to this area and can be injured, causing inflammation or tendinitis (lateral epicondylitis, or "tennis elbow"). The inner portion of the elbow is a bony prominence called the medial epicondyle. Additional tendons from the muscles attached here can be injured, causing medial epicondylitis, or "golfer's elbow." A fluid-filled sac (bursa), which serves to reduce friction, overlies the tip of the elbow (olecranon bursa). Bumping the tip of the elbow can irritate this bursa. The elbow can be affected by inflammation of the tendons or the bursae (plural for bursa), or conditions that affect the bones and joints, such as fractures, arthritis, or nerve irritation.